A rare mineral with potential industrial and medical applications has been discovered on alpine plants at Cambridge University Botanic Garden. Scientists at Sainsbury Laboratory Cambridge University have found that the mineral vaterite, a form (polymorph) of calcium carbonate, is a dominant component of the protective silvery-white crust that forms on the leaves of a number of alpine plants, which are part of the Garden’s national collection of European Saxifraga species. 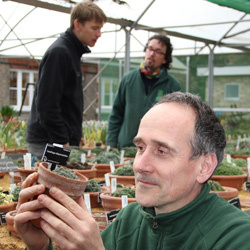 Botanic Garden Alpine and Woodland Supervisor, Paul Aston, and colleague Simon Wallis, are pioneering studies into the cellular-level structures of these alpine plants with Dr Wightman. Mr Wallis, who is also Chairman of the international Saxifrage Society, said: “We started by sampling as wide a range of saxifrage species as possible from our collection. The microscope analysis of the plant material came up with the exciting discovery that some plants were exuding vaterite from “chalk glands” (hydathodes) on the margins of their leaves. Dr Wightman said two new pieces of equipment at the microscopy facility were being used to reveal the inner workings of the plants and uncovering cellular structures never before described: “Our cryo-scanning electron microscope allows us to view, in great detail, cells and plant tissues in their “native” fully hydrated state by freezing samples quickly and maintaining cold under a vacuum for electron microscopy. Story by Kathy Grube, Communications Manager, Sainsbury Laboratory. Saxifraga sempervivum, an alpine plant species discovered to produce "pure vaterite".